38. How Does She Walk Him? The Nomura’s Jellyfish is so big, the scuba diver beside it looks more like a bathtub toy than a person. He’s a little too close for comfort with those stinging tentacles! No, it isn’t as scary as a shark, but you still wouldn’t want one to brush against your leg, would you? …a 26 pound fox! In this picture, you can see what a normal fox looks like beside this massive specimen, who was hunted down after a string of cat attacks and kills in the surrounding neighborhood. While it’s a shame that a hunt was needed to protect other animals, it’s a truly beautiful creature. Speaking of sneaky animals, this next “bandit” is huge! Who doesn’t love a sweet little raccoon? 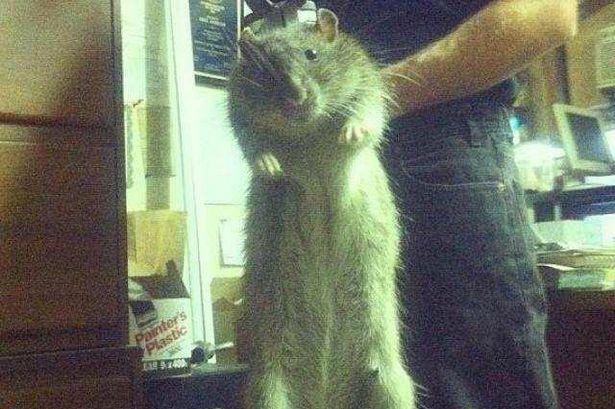 If you saw this massive specimen wedged in between your garbage bins, you might rethink your stance on these nocturnal creatures, which are normally quite a bit smaller. This one tips the scales at an astounding 75 pounds! 33. It Was HOW Long? …this absolutely massive snake! With a staggering length of 55 feet total, it was longer than 9 average men laying head-to-feet! Anything this crazy-long reptile has in its sights for dinner doesn’t stand a chance. This is a sunflower starfish, and it’s considerably larger than the 5-pointed starfish that most people look for while beach combing. It can actually have up to 4 times the number of arms – 20 – that enable it to move quickly around the ocean floor in search of food. One thing’s for sure, it wouldn’t be chowing down on this next ocean dweller! Gorillas are a fascinating look into the human-like characteristics of primates, but they’re also massive! Standing taller and wider than even a larger-than-average man, their muscle strength is incredible, and they can be very dangerous if angered. In harmonious situations, however, gorillas have been taught sign language and can perform rudimentary communication skills. 25. Um…Nice Birdie. Goooood Birdie. …a ticked-off Ostrich. 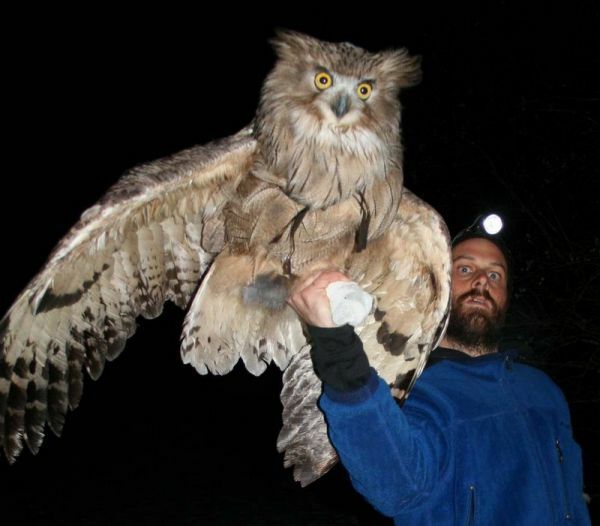 These sensationally large birds may be flightless, but they can run faster than people think. The average specimen stands as high as the average man, 5 feet 9 inches tall. It’s safe to say that this particular ostrich may be a bit larger than that! 23. That’s a Lot of Meow Mix! A 115 pound tortoise! 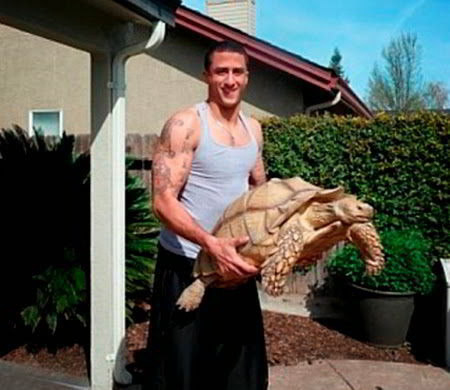 A far cry from the tiny box turtles most children discover in their yards, this big boy is named Sammy and is much-loved by his owner – a NFC-champion quarterback. It’s a good thing, too, because tortoises can live even longer than human beings with the right care. 21. That’s Not a Chair! When we spot the relatively small-sized elephants trotted out by traveling zoos and circuses, it can be easy to forget how big wild elephants can truly get! This elephant was just using the car beneath him to scratch an itch on his stomach, but I bet the terrified occupants didn’t know that! A catch that would make even Jules Verne speechless, this 44 foot giant squid was captured back in 2007. From the deck of the boat, it was probably more amazing than terrifying, but meeting this huge creature underwater, on its own turf, was probably an entirely different story. 18. Whooo Would Have Guessed? Ever see a Harpy Eagle? You have now! Those dinosaur-like feet would give even our beloved national bird, the Bald Eagle, quite the run for his money. I bet this big boy skips right over field mouse and moles and goes right for rabbits when he gets a little peckish – pun intended! Finding all these predators a little scary? This is the Giant African Snail and it grows to be up to 8 inches in length! Not exactly easy pickings for escargot, this slimy invertebrate looks like it might fight back if you try to grab it. It doesn’t get the crown for being the largest, slimiest creature on this list though – this next entrant likely does. No, your eyes don’t deceive you – this is a real photo of a monster called a Giant Freshwater Stingray. If you thought the rays at your local aquarium were huge, they’ve got nothing on this aerodynamic water-dweller. These shocking animals can weigh up to 1300 pounds each! 14. Now That’s a Fish! This is “Goldie” and his owner, holding a normal-sized goldfish for scale. Yes, that’s the same little 0.99 goldfish one would buy at a pet store. A goldfish will, in time, actually grow to the proportions of their containers. Bigger bowl, bigger fish – so keep that in mind when shopping for aquariums. 13. Are You Sure He Just Eats Fruit? 12. They Really Measure Fluffy? Zorba was a former titleholder that weighed an absolutely mind-blowing 343 pounds! If anyone tried to break into his house or hurt his owner, they were certifiably insane. 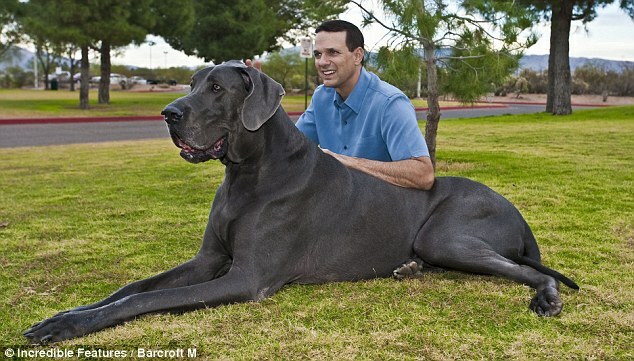 Just look at that huge pup – he’s practically a horse! Zorba might not be with us any longer, but this next big dog sure is! 9. George? More Like Clifford! George here weighs 252 pounds and measures 7 feet long. It must be tough finding a leash and collar that big! Believe it or not, this isn’t a CGI still from the latest Tim Burton movie. This is a Giant Weta Cricket, and that’s a real human hand, and a real full-size carrot. Suddenly, Jiminy Cricket seems like a much scarier character than he did the last time Pinocchio was on. 7. He’s Really Only 2? 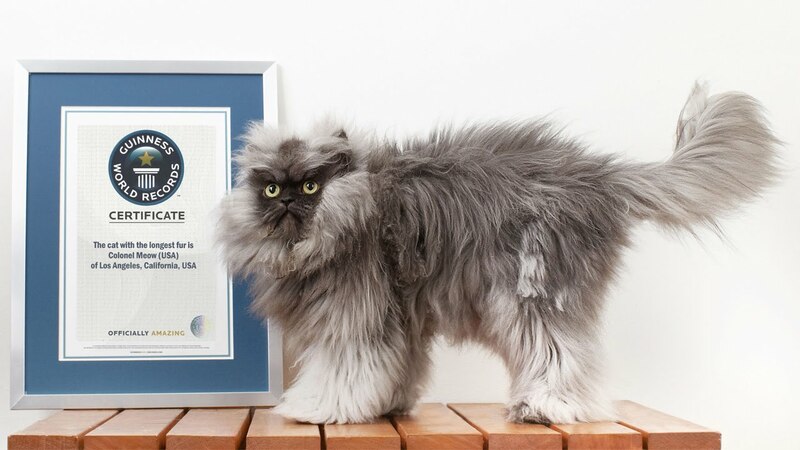 The simply-named Meow weighs 39 pounds, and is the current heaviest living cat on record. The catch? It didn’t take him nine lives to get this way – this husky fellow is a mere 2 years old! Imagine how massive he’ll be once he’s a little older. It’s a good thing he’s around, because animals like our next one need to be hunted down. Stewie might not max out the scales, but you’ll need a few rulers to account for his luxurious length: an incredible 48.5 inches long! He’s also the current titleholder for the longest tail on a cat, which makes sense when you see this photo of him at his full stretched-out beauty. The African Goliath Frog is shockingly large, and rightly so: it’s the biggest frog on earth. They can weigh over 7 pounds apiece, which really puts that toad you found in the backyard into perspective. That croak probably sounds for miles around! 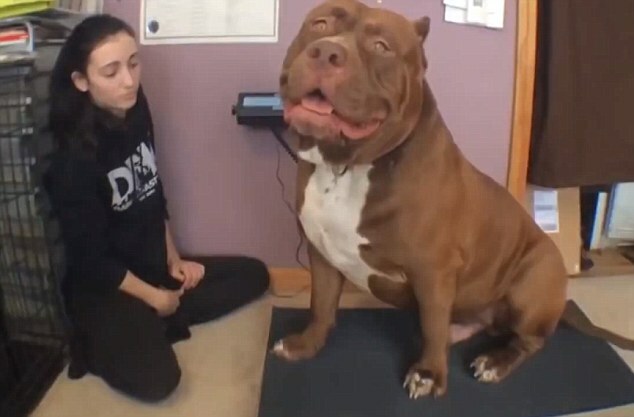 This 174 pound monster of a guard dog is Hulk, a pitbull specifically bred to protect his house and owners. He’s the largest living pitbull today, and his owners love him to pieces and say he’s super sweet! 1. 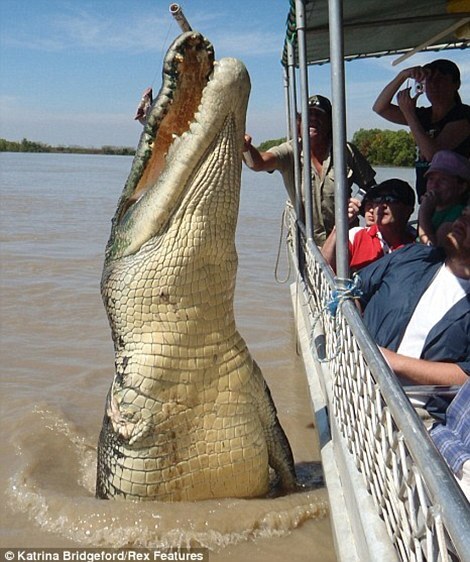 Hey that’s not a dog..
And finally, just so you don’t think domesticated pets have all the fun, we have the saltwater crocodile, the world’s largest living reptile.